Used to split a DVI Signal to two monitors. 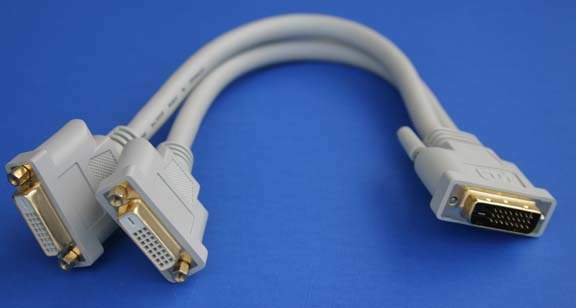 Our DVI Y cable provides a fast and easy way to simultaneously connect 2 monitors to a 1 computer. This shielded cable feature gold plated contacts to provide crystal clear video transmissions. With support for high-resolution DVI Images. Not Suggested for Long Cable Runs as the Signal is Divided in Half. But at a PCCABLES.COM Price.